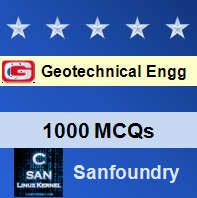 This set of Geotechnical Engineering Multiple Choice Questions & Answers (MCQs) focuses on “Analysis of well foundation”. 1. The selection of the depth of a well is based on which of the following criteria? i) There should be the adequate embedded length of well, called the grip length below the lowest scour level. ii) The well should be taken deep enough to rest on strata of adequate bearing capacity in relation to the load transmitted. 2. For alluvial soil, the normal scour depth can be calculated by ___________ formula. 3. The grip length of well is taken as _________ below the scour level in roads. Explanation: According to the code of practice of the Indian Road Congress, the grip length is taken as 1/3 R below the scour level. 4. For piers and abutment, the minimum depth of embedment below the scour level should be taken as _________ m.
Explanation: According to IRC code, it is recommended that the minimum depth of embankment below the scour level should not be less than 2.0 m for piers and abutment with arches and 1.2 m for other types of structures. 5. What are the horizontal forces that are prone to act on a well foundation? Explanation: A well foundation is liable to the following horizontal forces: i) force on account of water current ii) wind forces iii) seismic forces iv) earth pressure v) centrifugal forces. Explanation: Based on the assumptions done by Banerjee and Gangopadhyay in 1960, the analysis of well foundation can be done. 7. The maximum depth of scour at the nose of pier is _______ Lacey’s value. Explanation: The maximum depth of scour at the nose of the pier, is found to be twice the Lacey’s value of normal scour depth: R = 2RL. Explanation: Factor m, called the coefficient of horizontal soil reaction depends on the nature of soil, size and shape of the area which carries the load. Explanation: When a rigid soil, embedded in sand, starts moving parallel to its original position under the action of a horizontal force, it transforms the soil on one side to passive state and the other side in to active state. 10. According to Terzaghi and Peck, the ultimate bearing capacity can be determined by which of the following expression? Where R = radius of well, Df = depth of well, fs = average skin friction.